What's a Tim Tam, you ask? A Tim Tam is a chocolate wafer cookie with a chocolate cream center, produced and popular in Australia. Last Christmas, Eric's sister, who had spent some time traveling through New Zealand, introduced us to Tim Tams, and how to do the "Tim Tam Slam" with coffee. 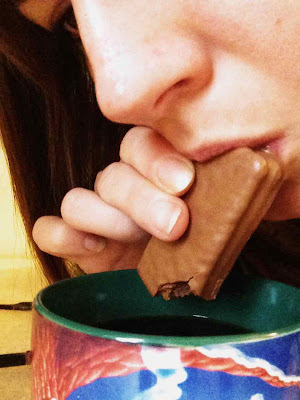 After my first "Tim Tam Slam," I was hooked. I spent the next 11 months looking through import grocery stores hoping to find Tim Tams, but never did. So I was completely surprised when walking through Target the other day and there they were, on the end of an aisle in the grocery section - Tim Tams! Pepperidge Farm is a sister company of the original Tim Tam maker, Arnott's, and apparently for the last couple years they release Tim Tams to Targets only between October-March. I quickly bought a box, anticipating my first Tim Tam Slam with my coffee the next morning. So, what is a Tim Tam Slam? It's a delectable combo of coffee and Tim Tam, consumed just so, and very precisely, and is the richest, tastiest treat ever. 1. RUN, don't walk, to your nearest Target. Find the Tim Tams with the rest of the Pepperidge Farm cookies and buy AT LEAST 14 boxes. Okay, maybe you don't need that many, but after your first taste you'll want that many. 2. Prepare your coffee any way you like it. Pour it in a mug. Get your Tim Tams ready. 4. Take one of the bitten-off corners in your mouth like a straw. Then dip the opposite corner in your coffee and sip the coffee up through the cookie like a straw. But AS SOON AS YOU TASTE THE COFFEE COMING THROUGH, immediately remove the cookie from the coffee and slam the whole thing in your mouth. What ensues is a melty, chocolatey, coffee-laced treat that is so addicting you'll immediately want three more. Special thanks to Kimber for introducing me to Tim Tams and the Tim Tam Slam. I am forever changed because of it.